Cameroon which has an estimated population of 22 million, is located in Central Africa and borders Nigeria, Chad, Central African Republic, Gabon, Republic of Congo and Equatorial Guinea. It is divided into 10 regions with 189 health districts, which form the implementation unit for all health activities in the country. Neglected tropical diseases such as lymphatic filariasis (LF), schistosomiasis, trachoma, onchocerciasis, and soil-transmitted helminthiasis (STH) continue to be endemic in Cameroon with 21.4 million people being at risk of infection. They typically affect the larger proportion of the country which live in rural areas and usually tend to be poor and lack access to a clean source water, basic health services and essential medicines. These diseases have always posed problems for the Cameroonian people as they not only cause health burdens but also social and economic burdens as adults who are affected account for a loss in economic productivity. The control of NTDs represents a major challenge to those providing health care services in the endemic countries such as is the case in Cameroon. In addition,the fight for the control of NTDs has been overshadowed by other health challenges such as HIV/AIDS and Malaria which has resulted in them being called the silent plague. However, in recent years the Cameroonian government has gone on the offensive and has put in more effort in trying to eliminate these diseases by 2020. Why was the programme created? 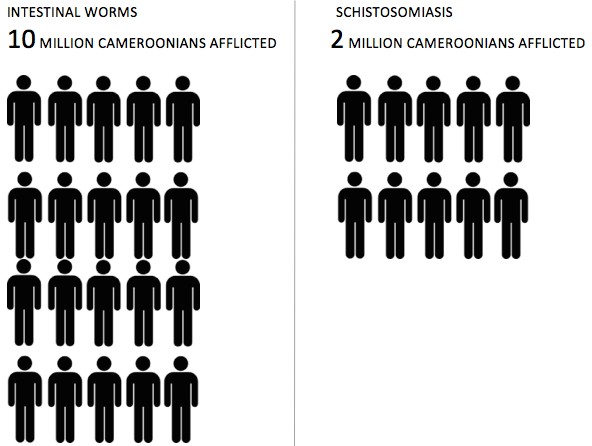 Schistosomiasis and STH alongside other NTDs continue to pose a great public health risk for the people of Cameroon. 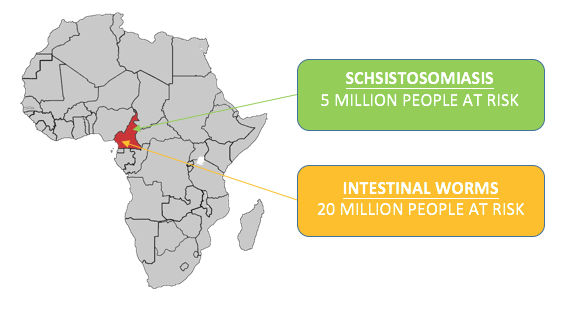 About 2 million Cameroonians suffer from schistosomiasis while this number shoots up to 10million people in the case of intestinal worms. When it comes to schistosomiasis, 5 million people are at risk of being infected. No area or group of persons is spared as urban areas are just as affected as rural areas. However, the most vulnerable group affected by schistosomiasis and intestinal worms are school-age children (5-15 children). In efforts to try and curb this public health issue affecting for most part, our children, the government put in place the National Program for the Control of Schistosomiasis and Soil transmitted Helminthiasis. This control programme is one of the priority programmes of the Ministry of Public Health, that provides leadership on all activities aimed at combatting schistosomiasis and STH in all regions of Cameroon. Created in 2003 and officially launched in 2004, the program has been successful in influencing health policies around the control of schistosomiasis and STH in Cameroon. What Are the Priority Actions of the National Programme for the Control of Schistosomiasis and Intestinal Helminthiasis in Cameroon? To regularly treat all school age children. To educate communities about worms and the risks of infection. 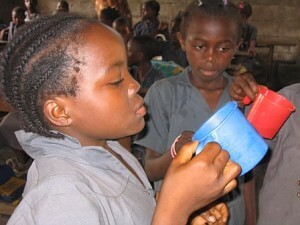 To promote hygiene, good water and sanitation systems in communities. Why Target School Age Children For Treatment? Children are the most heavily infected group in a community. Children’s health is seriously affected by worms. Children only have one chance to go to school. If they are absent or sick for most of the time, they lose their only chance to learn. The school system provides the perfect channel to reach all school children. The drugs are easy and safe to administer. This means that teachers can be trained to deliver them, which takes some of the pressure off the regular health staff.